Others have reported transmissions problems while making basic changes in speeds such as stopping and going at a stoplight, as well as shifting gears from forward to reverse. Owners have also noticed the car acting up in strange situations… such as going down a hill. In many of these situations, owners have observed that the “check engine” light did not illuminate. Often times, owners have had to pull over and turn the car on and off again, only to have the problem start up again within minutes. Driving a sputtering car can be especially terrifying when merging on and off of highways. Consumers have complained about the Altima’s inability to accelerate. 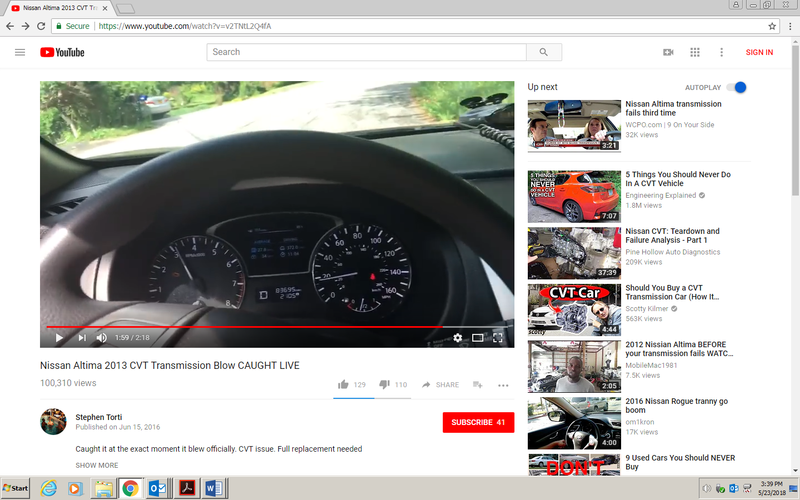 One Youtuber even reported having his transmission failing in the middle of a busy intersection! Others have had cars stalled while in traffic, causing expensive repairs as well as the towing costs, as well as the hassle and stress of having a car break down in the middle of the road. Car owners have observed and felt this sputtering without being alerted on their dashboards to check their engines. The problem does not come with a cheap fix. When brought for service, the technician will either replace the transmission valve body, or replace the entire transmission. The valve replacement alone can cost $1200. When the valve is replaced the repairman will also take away excess metal pieces that have developed as a result of the transmission process. 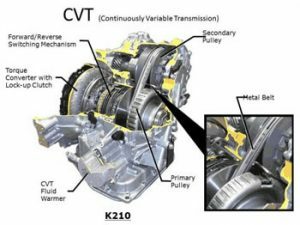 Frequently, replacing the transmission valve body is insufficient, and consumers have been forced to replace their transmission, which can cost around $4000, each time. Many consumers are on their third and fourth replacements, even before reaching 50,000 miles. Some consumers have reported problems with their transmission in as little as a thousand miles. The problems have been widespread, leading shortages in replacement parts while consumers wait for their vehicles to get fixed. 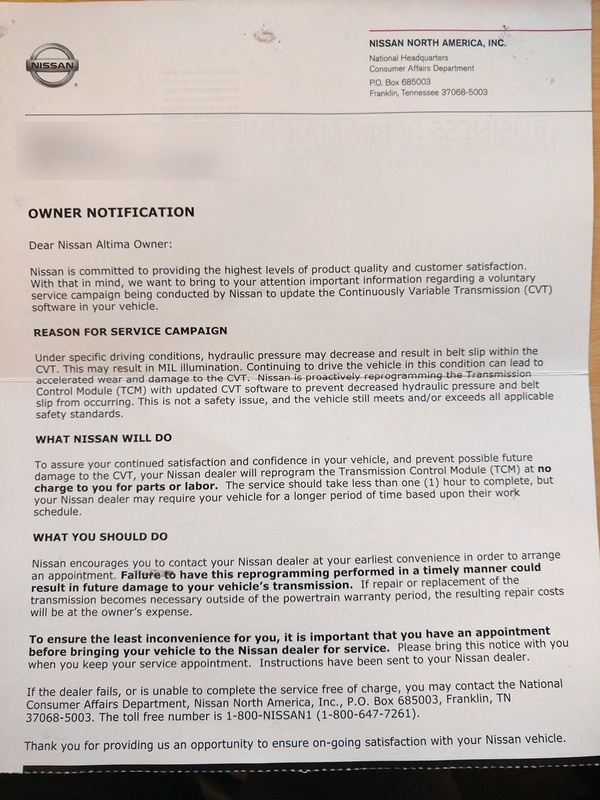 Consumers have also reported that Nissan has denied acknowledging the problem in instances when consumers brought the issue to its attention. Nissan issued a recall on its Transmission Control Module, (“TCM”) for its 2013 Altima, in an attempt to improve the hydraulic pressure on the CVT. Nissan urged owners of the Altima to get the TCMs reprogramed to avoid “damage to your vehicle’s transmission.” But complaints have persisted. 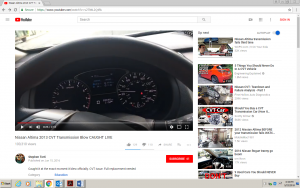 Currently there are 250 NHSTA Powertrain Complaints about the Nissan Altima, most of which are about the CVT. Nissan has extended its warranty on 2003 to 2010 models, but has not done so on its newer models. For its part, the national Plaintiffs’ firm Cafferty Clobes Meriwether Sprengel LLP is investigating Nissan’s behavior, and would be happy to take your call to discuss any potential claims you may have.